Antoine Larricq at Fraser Yachts tells me he's closed on his listing for sale, the intriguingly-named 39.9 metre motor yacht Evil Zana with Debbie Beere at Dbeere Yachts representing the buyer. Built by Britain's Sunseeker International yard to RINA class and designed by Don Shead as one of the yard's Predator 130 models, Evil Zana was delivered in 2010 and has extras in excess of the Sunseeker Platinum package. Accommodation is for eight guests in four staterooms including a main deck owner’s suite. The master suite is equipped with a hydraulic balcony and so is the saloon, with balconies on both sides of the sitting area. MCA compliant, she accommodates eight guests in the master suite, two doubles and a twin cabin, all with en suite facilities. The interior, by Design Unlimited, has oak paneling and floors while a spacious sundeck features a spa pool, sun beds, wet bar and grill, making it the ideal area for al fresco entertaining and dining. 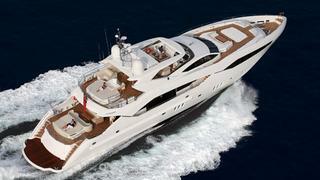 Twin 3470hp MTU engines power Evil Zana to a speed of 22 knots and she was asking €7,950,000.